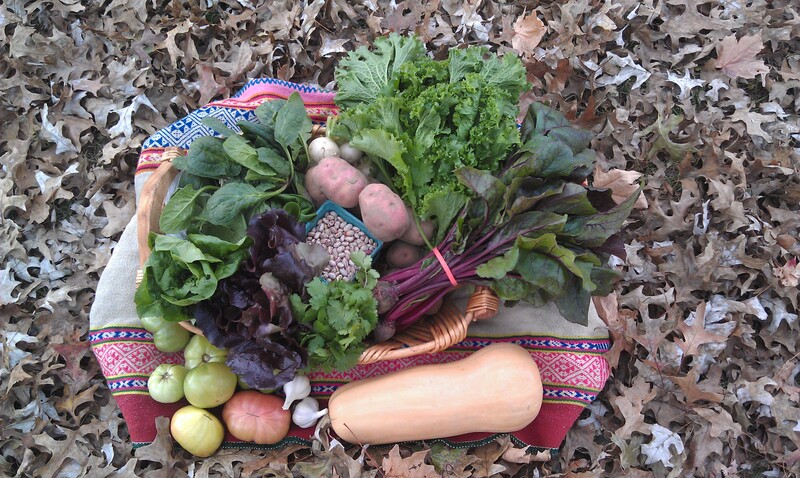 Reserve your spot for the final CSA dinner, 6 PM, Tuesday November 19 at Bethany Peace UCC. We want to send a huge thank you to all of our Week A members who are receiving their last share this week. Thank you for your support and participation. *Two notes: Sweet potatoes are not the best looking, but will taste just fine. Some are a little small, some have a tough or soft spot on the end. We gave you the best of what we had. *Turnips: we are calling these salad turnips because they are best used raw. They are quite different from most turnips. I am usually no proponent of turnip eating, but these truly are delicious. This Japanese variety is milder and sweeter than a radish, at least at this size. The quantity is small, but the taste makes up for it. Take a moment to just admire that beautiful red-speckled bean. This pretty little bean that looks like a bird egg is actually a piece of history, in your hands. As an heirloom bean, it’s been passed down through the generations in Missouri. The modern food industry didn’t see much value in it so the bird egg bean was left by the wayside. Now it’s actually an endangered food. But it turns out the best way to save an endangered food is to eat it! (To learn more look up the ‘Ark of Taste.’) Slow Food St. Louis supported our efforts this year to share this part of our regional food history with you. We think it’s important to hold on to the diversity of our food sources. And we think beans are pretty important too. Beans can help you stretch your food dollar because they work in so many dishes and are a low-cost source of protein. Try a Meatless Monday this winter. It’s a popular way to cut back and get a handle on the food budget. More and more people are doing it. Beans are so filling and satisfying in soup, or with rice or pasta, or greens, you’ll never miss the meat. Since these beans just finished drying, the cook time is not long, maybe a bit more than an hour. You don’t need to worry about over-cooking your beans. Just check in from time to time to spoon a few out and see how you like them. Last night, I knew my pot was ready when they were very soft but not yet splitting their skins. If you’re not used to beans you might feel a little gassy after eating them. That’s normal. The thing to remember is if you make beans a regular part of your diet, you’ll have less gas and more pocket money. Your 3/4 of a pound bag of dried beans will cook up to about 6 cups of beans and broth. If using them with a pasta, be sure to dress and color up the dish with this week’s beet or mustard greens. Top it all off with that cilantro, unless you’re saving it for that green salsa. Cilantro will be back next week too. 1)For long-term dried bean storage, remove them from the paper bag and store them in a mason jar. 2) These are freshly harvested beans. They will not need to be soaked as long as store bought beans. 3) Refer to extension paper earlier distributed for info on using beans.